History | Psssst! Over Here! Do the computer models used by meteorologists and climatologists take into account solar sunspot activity or coronal mass ejections? Can those phenomena explain our unusually warm weather here and the crazy weather elsewhere? Mathematical simulations of the atmosphere (the “models”) do not take into consideration solar activity. Sunspots are dark-appearing areas of reduced temperatures on the surface of the sun. Their number varies through an approximate 11-year cycle, but there are no known corresponding cycles in Earth’s weather. Coronal mass ejections — clouds of charged particles ejected from the sun’s surface — produce spectacular auroral displays if they reach Earth, but have little demonstrable effect on the weather. This is extremely misleading, because that bolded text, which makes a larger and more general statement, is just not true. There are definite corresponding cycles in Earth’s weather. And I would really hope that a meteorologist would know that. Hey, I know it, and I’m just some guy who reads blogs on the Internet. And one thing that is very odd is that you never hear about sunspots and their effect on climate in the news. I’ll let you guess just why that is. There have been many periods in history with little or no sunspot activity, known as the Maunder Minimum (1610-1700), the Dalton Minimum (1790-1830), plus several older minmums, and more recent unnamed minimums, and these periods show a very clear relationship to temperature, as explained in this guest post from WattsUpWithThat.com, Easterbrook on the potential demise of sunspots, by Don J. Easterbrook, Professor of Geology, Western Washington University, Bellingham, Washinton. So, let’s learn about sunspots! Galileo’s perfection of the telescope in 1609 allowed scientists to see sunspots for the first time. From 1610 A.D. to 1645 A.D., very few sunspots were seen, despite the fact that many scientists with telescopes were looking for them, and from 1645 to 1700 AD sunspots virtually disappeared from the sun (Fig. 1). During this interval of greatly reduced sunspot activity, known as the Maunder Minimum, global climates turned bitterly cold (the Little Ice Age), demonstrating a clear correspondence between sunspots and cool climate. After 1700 A.D., the number of observed sunspots increased sharply from nearly zero to more than 50 (Fig. 1) and the global climate warmed. The Maunder Minimum was not the beginning of The Little Ice Age—it actually began about 1300 AD—but it marked perhaps the bitterest part of the cooling. Temperatures dropped ~4º C (~7 º F) in ~20 years in mid-to high latitudes. The colder climate that ensued for several centuries was devastating. The population of Europe had become dependent on cereal grains as their main food supply during the Medieval Warm Period and when the colder climate, early snows, violent storms, and recurrent flooding swept Europe, massive crop failures occurred. Winters in Europe were bitterly cold, and summers were rainy and too cool for growing cereal crops, resulting in widespread famine and disease. About a third of the population of Europe perished. Glaciers all over the world advanced and pack ice extended southward in the North Atlantic. Glaciers in the Alps advanced and overran farms and buried entire villages. The Thames River and canals and rivers of the Netherlands frequently froze over during the winter. New York Harbor froze in the winter of 1780 and people could walk from Manhattan to Staten Island. Sea ice surrounding Iceland extended for miles in every direction, closing many harbors. The population of Iceland decreased by half and the Viking colonies in Greenland died out in the 1400s because they could no longer grow enough food there. In parts of China, warm weather crops that had been grown for centuries were abandoned. In North America, early European settlers experienced exceptionally severe winters. So what can we learn from the Maunder? Perhaps most important is that the Earth’s climate is related to sunspots. The cause of this relationship is not understood, but it definitely exists. The second thing is that cooling of the climate during sunspot minima imposes great suffering on humans—global cooling is much more damaging than global warming. What can we learn from this historic data? Clearly, a strong correlation exists between solar variation and temperature. Although this correlation is too robust to be merely coincidental, exactly how solar variation are translated into climatic changes on Earth is not clear. For many years, solar scientists considered variation in solar irradiance to be too small to cause significant climate changes. However, Svensmark (Svensmark and Calder, 2007; Svensmark and Friis-Christensen, 1997; Svensmark et al., 2007) has proposed a new concept of how the sun may impact Earth’s climate. Svensmark recognized the importance of cloud generation as a result of ionization in the atmosphere caused by cosmic rays. Clouds reflect incoming sunlight and tend to cool the Earth. The amount of cosmic radiation is greatly affected by the sun’s magnetic field, so during times of weak solar magnetic field, more cosmic radiation reaches the Earth. Thus, perhaps variation in the intensity of the solar magnetic field may play an important role in climate change. Are we headed for another Little Ice Age? In 1999, the year after the high temperatures of the 1998 El Nino, I became convinced that geologic data of recurring climatic cycles (ice core isotopes, glacial advances and retreats, and sun spot minima) showed conclusively that we were headed for several decades of global cooling and presented a paper to that effect (Fig. 5). The evidence for this conclusion was presented in a series of papers from 2000 to 2011 (The data are available in several GSA papers, my website, a 2010 paper, and in a paper scheduled to be published in Sept 2011). The evidence consisted of temperature data from isotope analyses in the Greenland ice cores, the past history of the PDO, alpine glacial fluctuations, and the abrupt Pacific SST flips from cool to warm in 1977 and from warm to cool in 1999. Projection of the PDO to 2040 forms an important part of this cooling prediction. Figure 5. Projected temperature changes to 2040 AD. 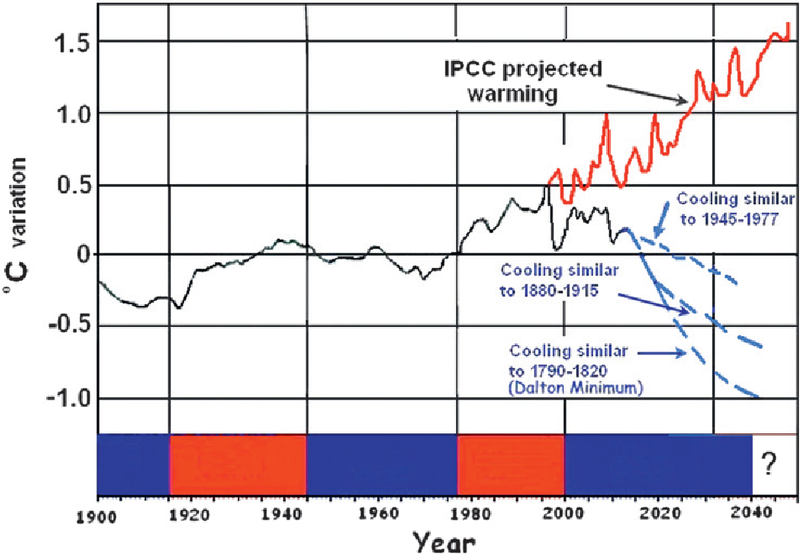 Three possible scenarios are shown: (1) cooling similar to the 1945-1977 cooling, cooling similar to the 1880-1915 cooling, and cooling similar to the Dalton Minimum (1790-1820). Cooling similar to the Maunder Minimum would be an extension of the Dalton curve off the graph. So far, my cooling prediction seems to be coming to pass, with no global warming above the 1998 temperatures and a gradually deepening cooling since then. However, until now, I have suggested that it was too early to tell which of these possible cooling scenarios were most likely. If we are indeed headed toward a disappearance of sunspots similar to the Maunder Minimum during the Little Ice Age then perhaps my most dire prediction may come to pass. As I have said many times over the past 10 years, time will tell whether my prediction is correct or not. The announcement that sun spots may disappear totally for several decades is very disturbing because it could mean that we are headed for another Little Ice Age during a time when world population is predicted to increase by 50% with sharply increasing demands for energy, food production, and other human needs. Hardest hit will be poor countries that already have low food production, but everyone would feel the effect of such cooling. The clock is ticking. Time will tell! So what say you, Tom? That statement you made is refuted by Prof. Easterbrook’s research. Recant your statement, or refute his research. And then address the larger point, that you made yourself up above: weather models do not account for this known effect on our climate. Which renders them unreliable and unscientific. And a little advice to those of you who like to make bold statements about our climate getting warmer due to CO2 — sadly, there is little evidence of that, while there is substantial evidence that warming stopped in 1998, even with CO2 increasing from 0.035% of our atmosphere to 0.039% (which is, of course, still a very small number): I’d do a little reading up on sunspots, if I were you. And buy yourself some long underwear. via ASK TOM WHY: Solar activity’s effect on weather – Chicago Weather Center.